A game by Arvi "Hempuli" Teikari for PC and Mac, originally released in 2015. 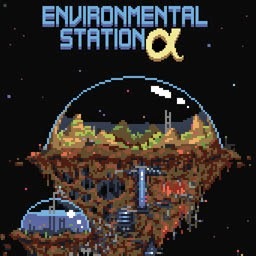 Environmental Station Alpha is traditional metroidvania, heavily influenced by Metroid and Super Metroid, featuring an expansive atmospheric world and chunky lo-fi visuals. The player takes on the role of a robot and is sent on a mission to explore a space station which was mysteriously abandoned many years ago. While there were no reported survivors, signals have been coming from the station recently which require investigation. The station was designed to house a variety of animal species and biomes, resulting in a wide array of creatures to fight and environments to explore. Story elements are light – involving a few computer terminals with logs from the station’s former inhabitants – offering some insight into past events and occasionally placing a marker on the map to provide direction to the player’s next objective. Otherwise, the player is free to explore within the limits of his abilities, solve environmental puzzles, discover powerups, and fight creatures and bosses in order to push his way further into new territory. 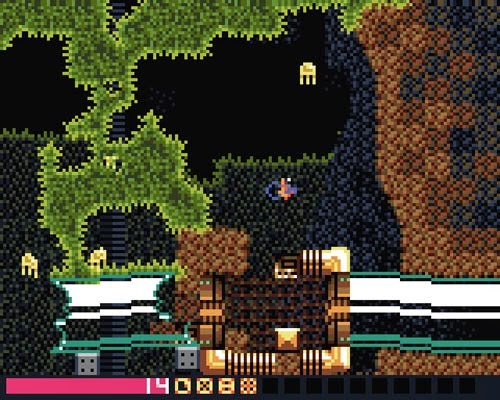 When the robot arrives on the station, he only has a 2x variable jump, the ability to move to the left and right, and a short-range weapon that he can fire in four directions. Environments are generally blocky, making it easy to determine which platforms are accessible with your starting abilities, although there are some complex organic environments and sloped surfaces as well. Fans of Metroid will instantly recognize nods to this classic series with small wall-crawling enemies that look and act very much like Zoomers, as well as larger two-legged jumping creatures that are similar to Sidehoppers. 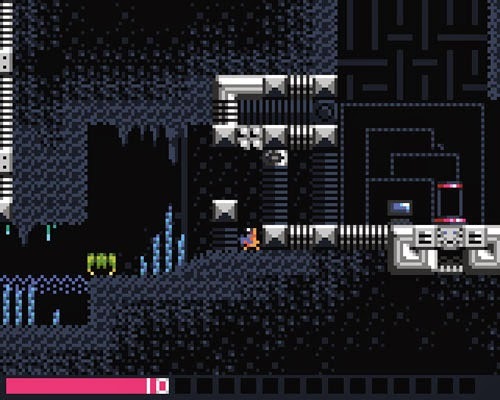 The general level design and tile layouts are very reminiscent of Metroid as well. 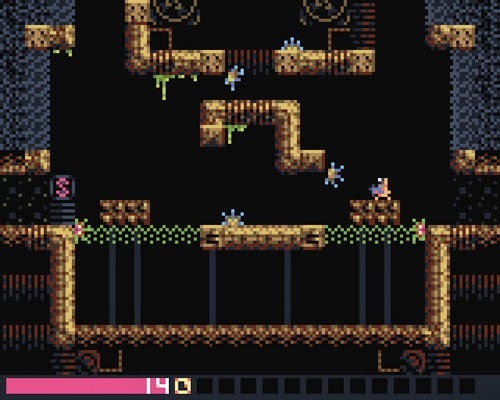 The opening area of the game is quite small, although a number of special tiles and configurations tease areas that will become accessible once you gain new abilities. Your first mission is to restore power to the area, and once you find the appropriate computer terminal, a boss fight ensues. 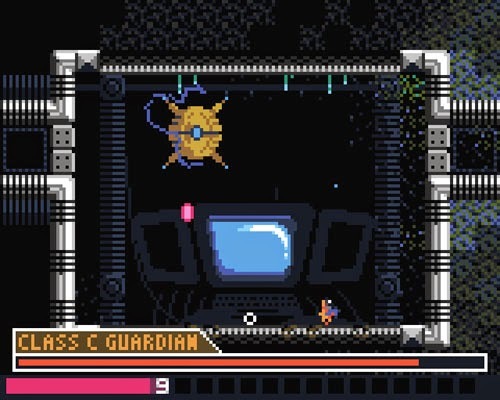 You face off against a hovering robotic guardian that spits pink bullets and occasionally powers down and drops to the floor for contact damage. You need to wait for the boss to drop to the floor in order to hit it, as your weapon falls just short of reaching the thing while it’s in the air. Once you defeat the boss, you leave the room the way you came and traverse a previously safe passage, only to have the floor drop out from under your feet. You fall down a long shaft with no way to get back to your ship or to communicate with anyone outside the station, supporting the genre’s trademark sense of isolation. The pause menu provides a traditional metroidvania map, displaying individual rooms and colored dots to indicate save points, teleporters, and other points of interest. The map is divided into color-coded sections to denote major regions of the station. 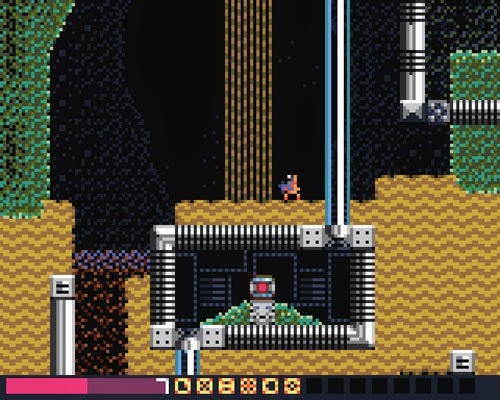 The color coding of the regions comes in handy when the player is tasked with moving to a remote part of the station that has not yet been explored. 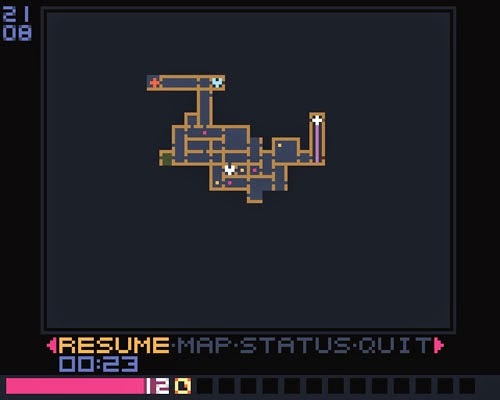 The remote area is highlighted on the map along with is corresponding color code, giving the player an indication as to where to start checking for new routes. The player can also switch to a zoomed in view of the map that has slightly more detail. Save points restore your health to full and save your game, but there are also dedicated health restoration pods that only restore your health. The Metroid series notably allows the player to pick up health that is dropped from destroyed enemies. 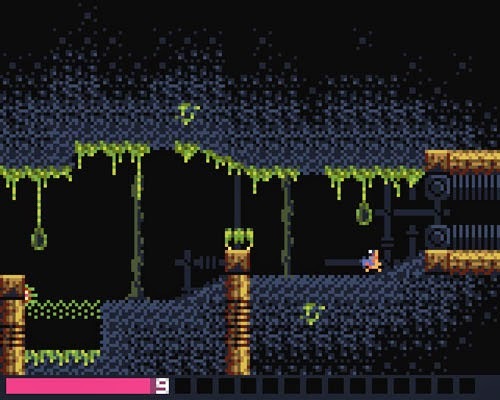 In Environmental Station Alpha, however, there are no enemy drops, and therefore no way to restore lost health other than finding a save station or a heath restoration pod. This design decision increases the difficulty somewhat and adds to the tension as the player must often venture far from the safety of health recovery. This is especially true since enemies respawn when the player leaves a room and returns (and puzzles are also reset). 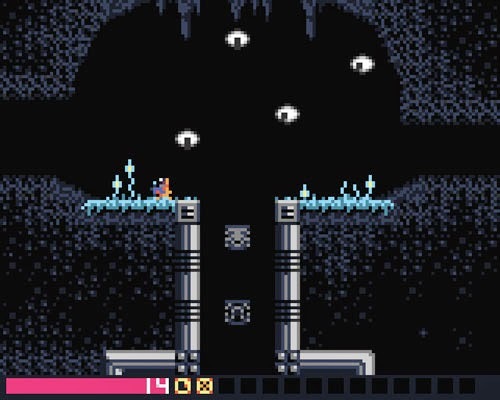 Defeating bosses and activating computer terminals often blocks the player’s previous route, forcing him to move into a new area unprepared… and possibly without much health remaining. This can occasionally cause situations where the player is killed and must re-fight a boss. With more than a dozen bosses to face, these battles occur with some regularity. Many boss encounters are complex multi-phase affairs that require players to study their enemy’s movements and attack patterns. 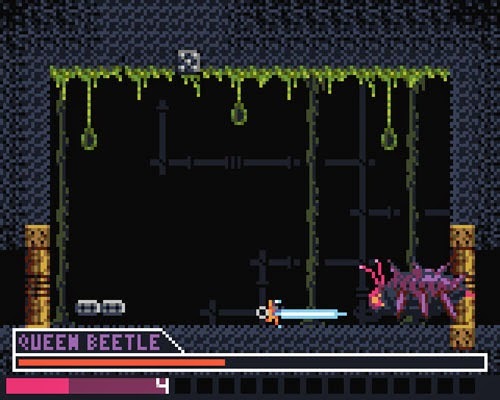 Players should not expect to defeat most of these bosses on their first attempt, as they tend to move quickly and have a wide array of attacks at their disposal, many of which change during a second or third phase. Complex battles involve environmental dangers as well, such as jutting spikes or pools of acid. 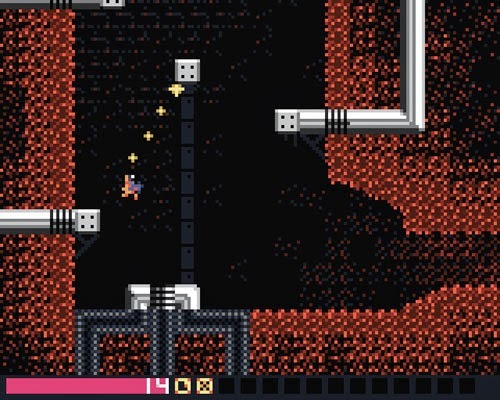 The primary driver behind the game is exploration, as the player must constantly push forward to find computer terminals and discover powerups that allow him to reach new areas. 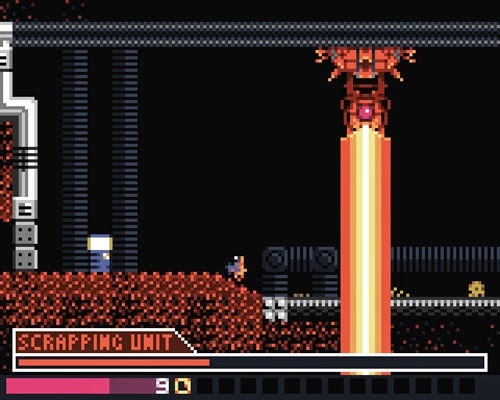 There are also a number of health tanks to be found – often in hidden areas – which extend your life meter, but not nearly on the scale of the Metroid series. The player starts with a mere 10 units of health and gets a bit more with each upgrade. Still, when compared to Samus Aran, the little yellow robot is quite fragile. Basic hits take off a single unit of health, while stronger enemies and bosses can take off two, and some hazards can drop off three units in a single hit. In addition, pits of acid and lava constantly drain the robot’s health as long as he is making contact. There’s also a volcanic area that drains the robot’s health as he moves through it, as well as computer terminal postings mentioning a suit that can be worn to protect him from the heat, referencing the Metroid series’ Varia Suit. In his explorations, the player will encounter a number of blocks, each with different properties. There are a few traditional Metroid-style blocks, like ones that disappear beneath the player’s feet and then immediately reappear, often dropping him down into a lower area with no way to return… and often used to trick the player. However, players can still jump away from these blocks in the split second before they crumble. There are also multiple colored blocks, such as blue blocks that can be destroyed once you earn the charge shot and red blocks that require a vertical or horizontal dash move. There are also flashing green blocks that act as switches, opening and closing different areas by making solid green blocks appear and disappear. In addition to the charge shot, and dash moves, players also earn a double jump and a “hookshot”, although this device works differently from the item of the same name in The Legend of Zelda series. The hookshot is a grappling hook. And, unlike the one in Super Metroid which required the player to shoot specific blocks, this thing can be used on almost any solid surface. 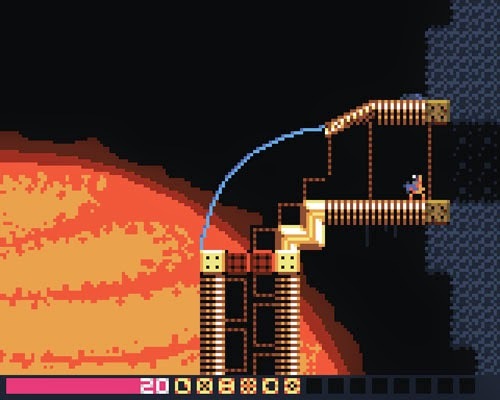 Use of the grappling hook – presented as a multi-part energy beam – is a bit stiff since the player cannot control the direction of the grapple nor his midair speed or trajectory. 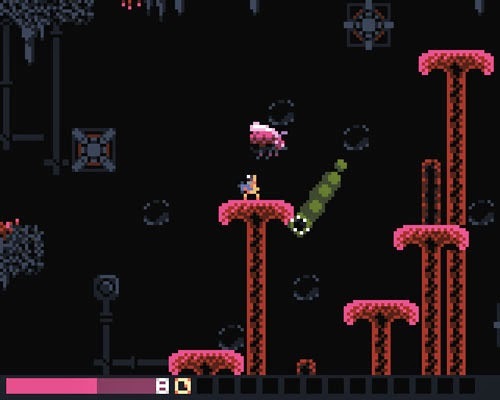 The grappling hook always fires at a 45 degree angle, and the robot immediately begins swinging once it makes contact. 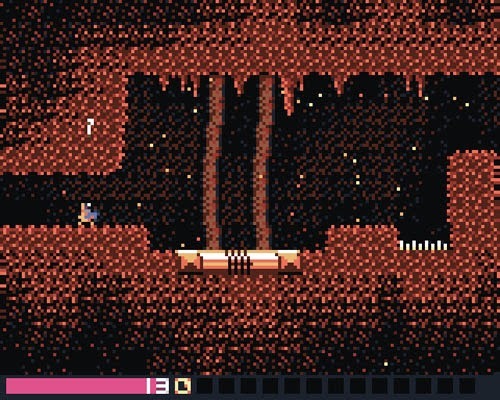 Early areas have a couple of places where the player must cross a gap, but later areas require the player to cross long distances with multiple successive grapples. While the player doesn’t have direct control over his character in mid-swing, the way in which the player uses the grapple greatly affects the arc of the swing and his speed. Grappling close to a solid object results in a short slow swing, whereas grappling at a greater distance lets the player perform a huge swing, potentially flinging himself high into the air. This move can be combined with the double jump and dash to allow for some very technical climbing sequences where the player needs to jump, turn around in midair, grapple a block above him, swing back the other direction, and then perform a double jump or vertical dash to hop up onto the block. Dashes and double jumps can only be used once in midair… but there are some exploits - like getting purposely knocked back by an enemy - that can be employed in order to do a bit of sequence breaking, which is another staple of the genre. A number of optional items are available to skilled players who are able to fully exploit their abilities and thoroughly explore the environment. 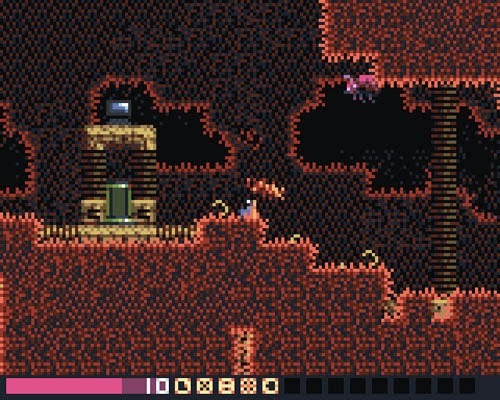 Once the player unlocks the ability to use teleporters, movement around the world is much faster, but the game also begins to become more complex. In the early going, the player’s potential path of travel is quite narrow given his limited moveset, making objectives fairly clear. Once the player has immediate access to the entire explored area of the map, it becomes easier to get lost or lose track of objectives. 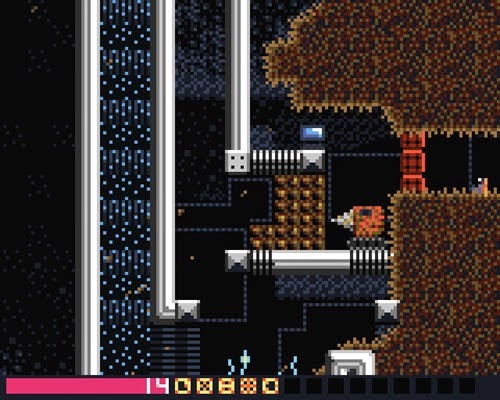 In addition, there is a point where the player restores power to all of the robots and electrically-powered devices on the station, which completely changes how the world is tackled… previously open doors will now close when you get near them, formerly unobstructed paths may have moving machinery, and there are loads of indestructible turrets that fire off frequent pulses of energy, making basic travel – even in formerly safe areas – more dangerous and more complex. Players may even find themselves getting “stuck” in formerly accessible areas, with a teleporter acting as the sole means of escape. 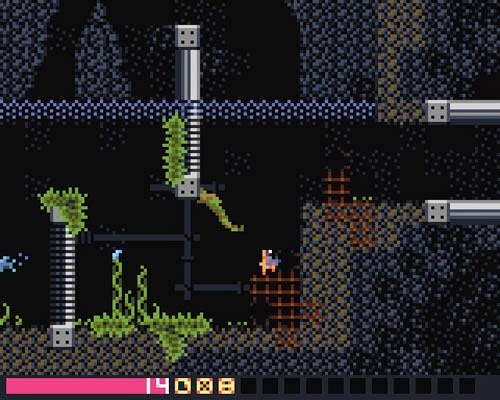 In addition to enemies and turrets, the player must also navigate a variety of environments, dealing with quicksand, fast-moving currents, spikes, and harmful plant blooms. There are also a number of areas where the path of travel is purposely obfuscated, with overgrown leaves blocking the player's view, or thick patches of seaweed that require the player to watch the behavior of nearby jellyfish to find the best way through. 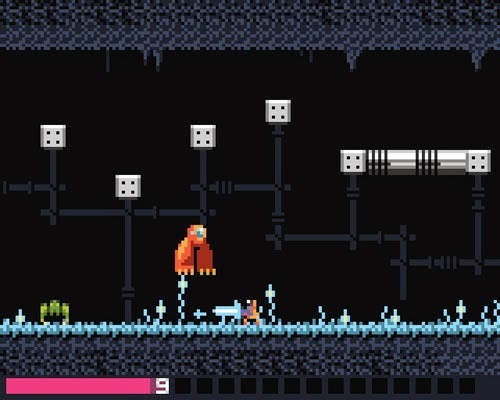 Given that the player character is a robot astronaut, water is no trouble for him, but his underwater movement is initially cumbersome, requiring multiple hops in order to swim upward. 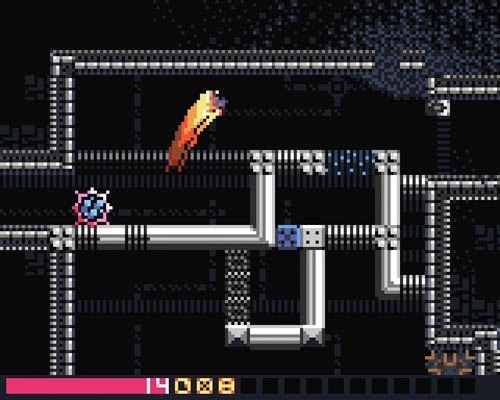 Early on, however, the player acquires an upgrade that lets the robot easily move in any direction while submerged, although most other powerups do not function underwater. There are a couple of oddities in the game’s design that act as minor distractions, such as the lack of feedback when causing damage to powerful non-boss creatures. When the player character takes damage, a number appears over its head to indicate how much damage was done, but this is not the case with enemies. While small enemies may be killed with one or two hits, there are a number of others that take multiple shots to kill, or which can only be damaged with a charged shot. The game does indicate when the player causes zero damage to an enemy by displaying a “0” over its head, but it’s not possible to tell how much damage is being done otherwise. Also, when using teleporters, the player does not cycle through all available teleportation destinations; instead, he must move a cursor around the full map and then select a room with a teleporter in it. Environmental Station Alpha was developed using Multimedia Fusion 2 by Arvi "Hempuli" Teikari, who hails from Finland. Music for the game was composed by Roope Mäkinen, and sound effects were created by Joonas Turner (The Swapper, Broforce, Nuclear Throne, Badland) and Niilo Takalainen. 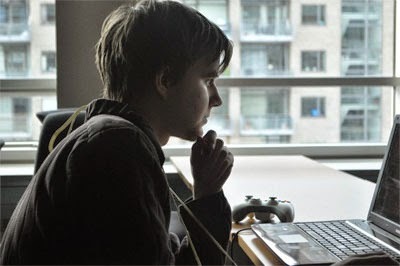 Development of the game originally began in 2011. 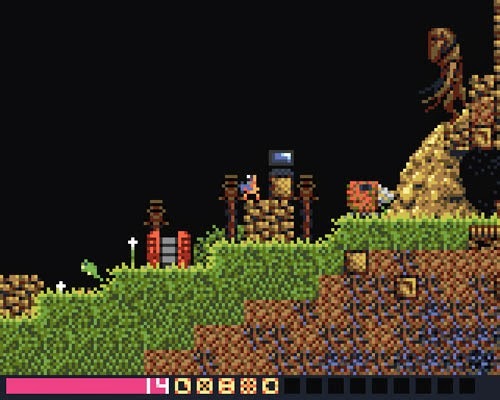 Arvi has developed a number of games throughout the years, many of which are experimental titles created for game jams, and all of his previous releases have been freeware. 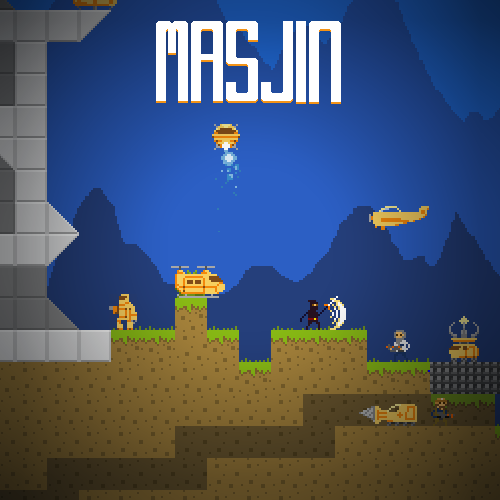 Perhaps his best-known prior release is a multiplayer construction/shooter called Masjin, which features shooting and base infiltration with a variety of combatants and vehicles, as well as crafting and construction.